The Dollar Index hit a new high in the last week but has since pulled back from that level. 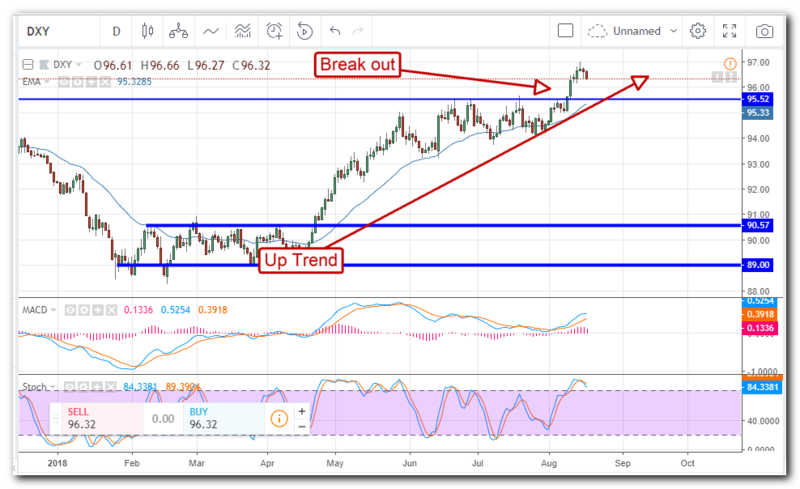 The high, near $97 and well above a target for long-term resistance, is the highest level the index has seen in more than 2.5 years and likely not the highest it will see in the coming weeks and months. 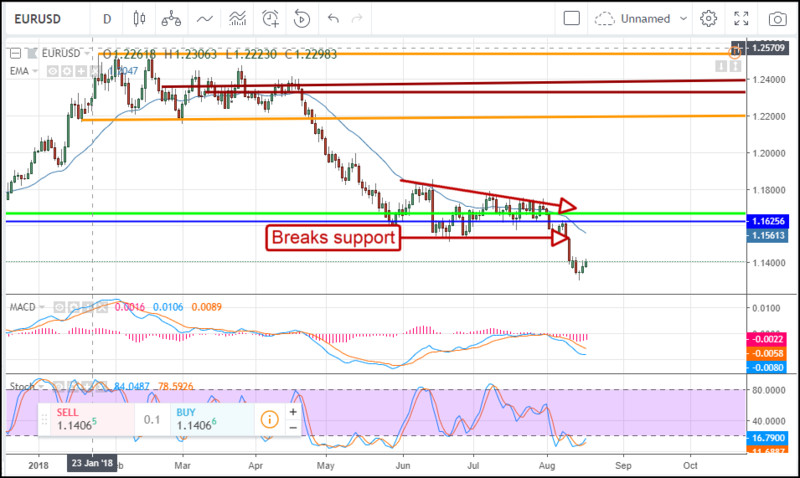 The rally in the dollar has been driven by many things but is underpinned by one fact; the US economy is strong and the leading the global expansion. This week’s data shows broad expansion within the US economy. Industrial gauges like the Philly Fed’s MBOS and the Empire State Manufacturing Survey show expansion within the manufacturing sector while housing market indicators come in above expectations. Employment data shows jobless claims continue to trend lower and are consistent with tightening conditions while Retail Sales were above expectations and show a strong consumer. The Dollar Index may have pulled back this week but the move is more likely a consolidation within uptrend than indication of reversal. The Index has recently broken out of a major triangle pattern and is headed up to the $100 level. The strength in the dollar is pushing the EUR/USD lower as well. 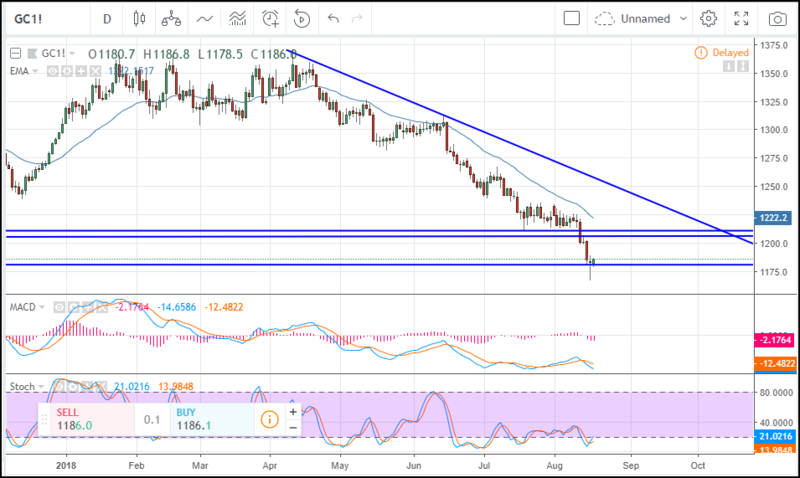 The single currency fell to a long-term low versus the dollar over the past week and has broken out of a flat-bottomed triangle and below a key support. The pair has entered a near term consolidation but has failed to move above last week’s close so sideways to downward pressure is likely to prevail. Gold prices also took a hit in this week’s action but may have reached bottom already. The spot price fell below the $1,180 level ad bounced higher to form a doji candle. The candle is indicative of support and is especially strong because it confirms my support line and is further confirmed by a bullish crossover in the stochastic. A move higher is not out of the question but is likely to find resistance at the $1,200 level if not lower. Even Bitcoin is not immune to the strong dollar. The world’s leading digital commodity and reserve cryptocurrency has fallen to long-term lows near $6,000 in tandem with the dollar’s surge to near highs. The token has confirmed support at this level and begun to bounce higher although the extent of the upswing is questionable. 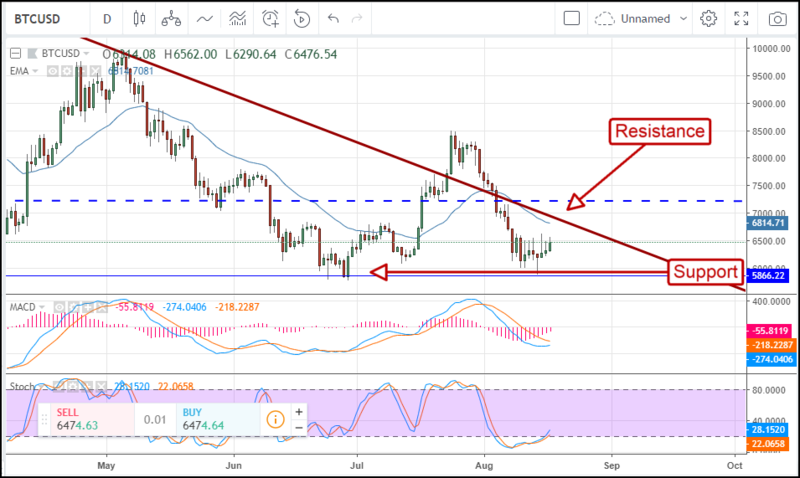 Bitcoin is facing many positive catalysts in the coming weeks and months but the market has yet follow through on bullish outlook. A move up may find resistance near $6,750, the short-term moving average and a key downtrend line.